I have been checking the weather models, both short and long term. I am starting to see indications that our weather pattern may finally change. I want to make one thing perfectly clear, this is what the EC weather model is saying for the long term. Until the actual weather happens, nothing is guaranteed. However, it does not hurt any of us to have something to look forward to. First let's refer back to my last post. It talked about the PNA and AO. I mentioned atmospheric rivers that bring copious amounts of moisture to our area when both the PNA and AO go negative. The PNA has been negative, however the AO has remained positive. That means cold air, an essential ingredient for large storms, has been trapped in the Arctic by the northern jet. The latest AO forecast has the index moving neutral and then negative. This could bring a very much needed change to our weather. 2013 was the driest year ever for our region. The funny thing about the climate is that averages rarely if ever translate into a normal pattern. That means if we have been dry for an extended period of time, the law of averages says we are going to be wet, sooner or later. Not a major storm, but a major pattern shift. 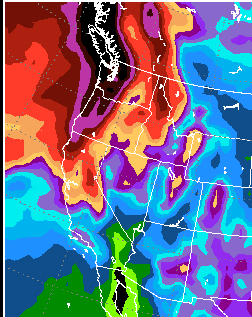 As the storm comes from the Pacific ocean over the Sierra instead of sliding down the east side of the Sierra. These are the types of storms that can bring major precip. Finally here is the 30 day outlook. This represents a major change and I am hoping it will change more. Right now we are looking at about 5 inches of liquid precip. 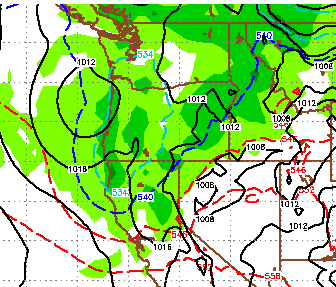 Two days ago this model was calling for 1/10 of an inch of liquid precip, so something could be in the works. Because of the disappointing winter, I would be remiss to remind my readers that this is a forecast and is subject to change. However, 2013 is just about over. 2014 ushers in a new year and hopefully a very different weather year from 2013.